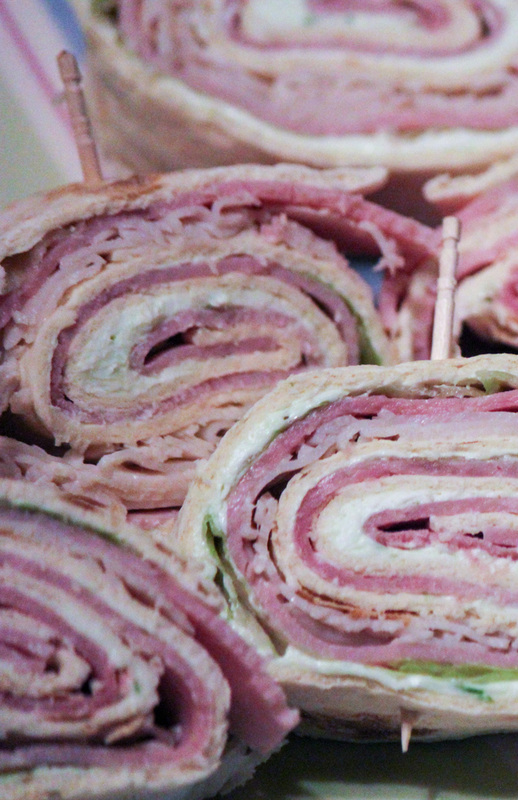 Easy Sandwich Pinwheels | Loads of Great Ways to Make These! 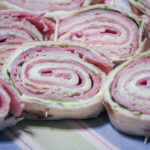 Want to know how to make Easy Sandwich Pinwheels? This recipe makes it super easy. Simply put everything together, roll and slice! Such a great appetizer! I love easy appetizers! Actually I just love appetizers, and when they are easy, well, then that makes it even better. These Easy Sandwich Pinwheels are the perfect appetizer for any occasion and will go fast, so make up lots! The last time I made these, we went through two trays in about 10 minutes. Just to give you a heads up. I think they are just so simple to make and then to eat, they just go fast. Easy Sandwich Pinwheels make great Super Bowl appetizers or Tailgating Party appetizers or whatever kind of appetizers you need. Since I originally posted the Easy Sandwich Pinwheels, I have discovered awesome Flatbreads that are designed specifically for this very reason. We just love them. Obviously, you can still use flour tortillas which are just as wonderful, and probably cheaper. These flatbreads make fantastic pinwheels, are much better than the flour tortilla kind and still make the very best appetizers out there! The best part of these Easy Sandwich Pinwheels is that you can change them up to first your families tastes or the theme of the party. For example, here are some with Salmon! 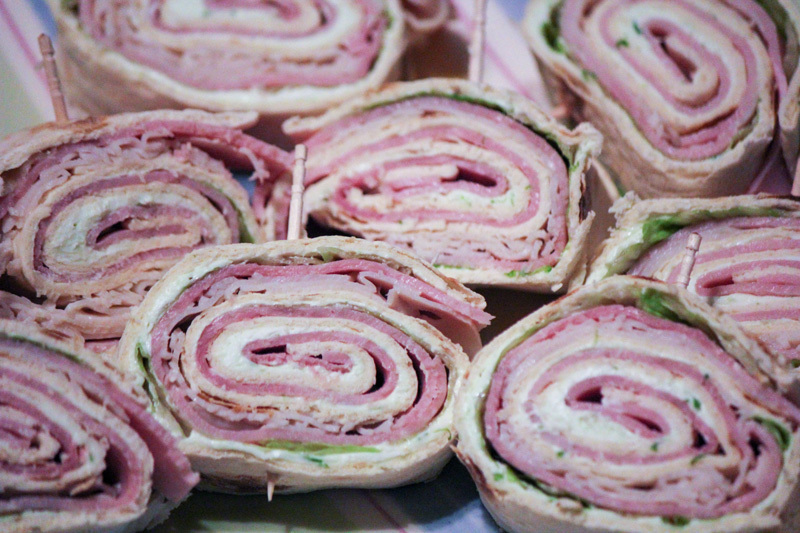 Are you ready to make some Easy Sandwich Pinwheels now? 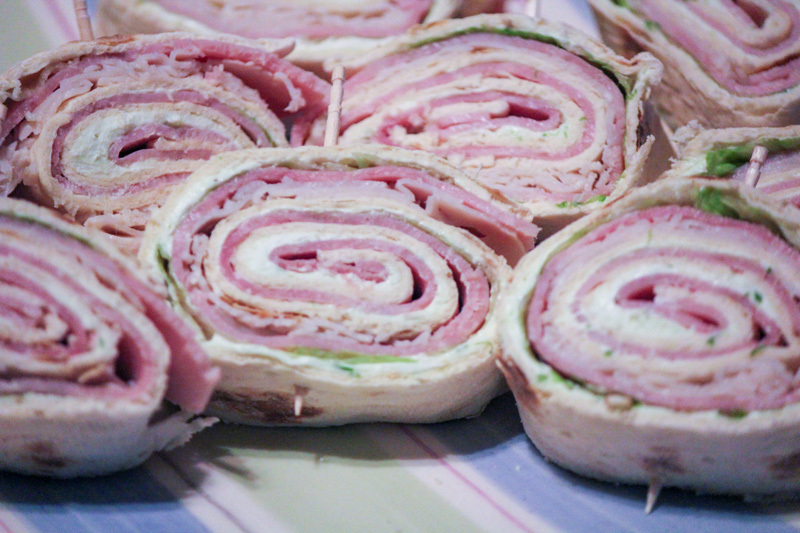 Want to know how to make Easy Sandwich Pinwheels? This recipe makes it easy, put everything together, roll and slice! Such a great appetizer! Cut the cream cheese into cubes and put it into a bowl (I used my stand mixer). Add the green onions, minced garlic, parsley and sea salt. Blend for about 3 minutes, or until entire mixture is combined and blended. Spoon mixture into a sealed container and refrigerate for an hour. It will keep in the refrigerator for up to 2 weeks in a tightly sealed container. Lay flour tortillas on a flat surface. Spread the cream cheese mixture across the entire flour tortilla. Layer the deli meats on top of each other completely covering the flour tortilla. Layer the lettuce on top – use enough lettuce to completely cover the deli meat. Roll up each flour tortilla. Use toothpicks to secure the tortilla. Depending on how thick you want them, will determine how many toothpicks you use. I was able to slice 10 pinwheels so I used 10 toothpicks. If you are able to slice 10 per tortilla you will wind up with 50 pinwheels at the end. Where do you buy the Flatout Pinwheels? Thanks. PS. I made these with regular flour tortillas and they are so good but I love those flatout tortillas. How long can pin wheels be stored in the fridge before serving? I made them earlier and they are awesome but I need to save them. I would imagine about 24 hours before you would see a noticeable change in the texture. They can either dry out or get way too soggy. I would not recommend more time than that.